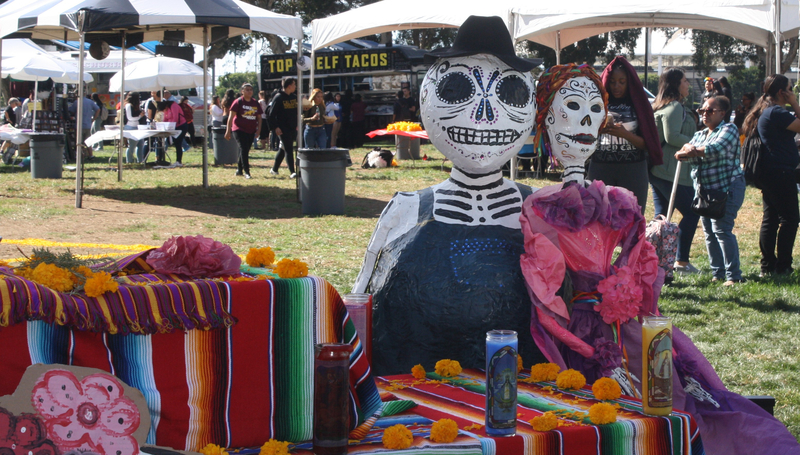 CSUDH held its annual celebration of Dia De Los Muertos (Day of the Dead) on Nov. 1, outside La Corte Hall. Scheduled events ranged from the Procession of Civil Rights to music and dance performances. Food trucks sold tacos and other traditional Mexican food while students painted sugar skulls and their faces, and paid respects to various altars. “It’s a way to celebrate the Catholic holiday of All Saints and All Souls, but it has deep Mesoamerican indigenous traditions woven into the holiday, which makes it uniquely Mexican,” said CSUDH History Professor Doris Namala. Namala uses the holiday with her Colonial Latin America and Colonial Mexican classes to study religion and syncretism. Namala said many of her students celebrate Dia De Los Muertos in their homes but also that many of the festivities at CSUDH were social justice oriented. “Students honored those who may have fallen for a social justice causes like Black Lives Matter or those who were killed over the weekend in Pittsburgh,” Sueki said. Students celebrating had varying reasons for attending the event. Liberal studies student Diana Cervantes painted sugar skulls and said for her, Dia De Los Muertos is a family tradition. Child development major Teresa Diaz was also among students painting skulls.